The Normandy Landings were the first operations of the Allied Powers' invasion of Normandy, also known as Operation Neptune and Operation Overlord, during World War II. D-Day for the operation, postponed 24 hours, became June 6, 1944, H-Hour was 6:30 am. The Normandy Landings were the first operations of the Allied Powers' invasion of Normandy, also known as Operation Neptune and Operation Overlord, during World War II. D-Day for the operation, postponed 24 hours, became June 6, 1944, H-Hour was 6:30 am. The assault was conducted in two phases: an air assault landing of American and British airborne divisions shortly after midnight, and an amphibious landing of Allied infantry and armoured divisions on the coast of France commencing at 06:30 British Double Summer Time. It required the transport of soldiers and materiel from England and Wales by troop carrying aeroplanes and ships, the assault landings, air support, naval interdiction of the English Channel and naval fire-support. There were also subsidiary operations to distract the Kriegsmarine and prevent its interference in the landing areas. The operation was the largest single-day invasion of all time, with over 130,000 troops landed on June 6, 1944. 195,700 Allied naval and merchant navy personnel were involved. 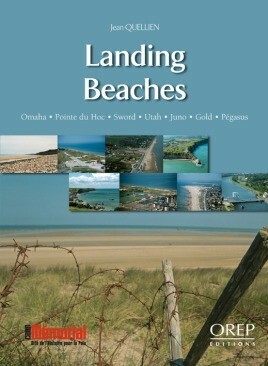 The landings took place along a stretch of the Normandy coast divided into five sections: Gold, Juno, Omaha, Sword and Utah. Sainte-Mère-Église, Pointe du Hoc, Ouistreham, Omaha Beach, Pegasus Bridge, Arromanches… so many names entered into history on the morning of the 6th of June 1944, to remain forever engraved in our memories. This fully illustrated guide, including period documents and colour photographs, offers an insight, sector by sector, place by place, not only of the legendary D-day landing sites, but also of the less widely known, but just as crucial areas. Enhanced by original maps, a series of “close-up views” offering detailed explanations, “at a glance” pages devoted to specific towns or sites and an introduction to the many museums available to history enthusiasts keen to see where it all happened.